For a brief period last week people driving into or out of Arundel might have noticed some confusing speed limit signs. Mark Phillips snapped these photos in Queen Street, Arundel, last Tuesday, showing the front and rear views of the same two signs. 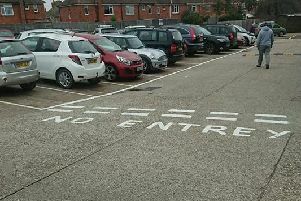 Mark said: “In fairness, the signs were in the process of being changed and the contractors had stopped for lunch halfway through the task. “I could not resist pulling over to capture these once-in-a-lifetime images.